I wish I could share this nourishing bowl of Vegan stew with you right now. So comforting! It features fresh leafy greens, vegetables, chickpeas , handful of spices and a secret ingredient that makes this stew all the more amazing! One more good news is that this vegan stew is oil free and gluten-free too. It makes a great meal on it’s own or you can pair this stew with some rice , a piece of crusty bread or naan. Don’t get confused between soup and stew. There is a slight difference between them. Stewing is a process where large cut vegetables or meat or beans is cooked low and slow. Basically you simmer the ingredients in water or stock simmering on low temperature for a longer time. The water/ stock reduces considerably forming a nice gravy like consistency. Slow cooking deepens the flavor too. You may say it is more curry like. You know how much I love curries right? I feel the only difference between a stew and a curry is the use of curry powder especially turmeric. My mom says “Eat your vegetables because it’s good for you. Add loads of beans to it and make it nutrition dense. Consuming beans is a great way to combat those in between meals hunger pangs. “And this combination of vegetables and beans really does the magic. I love making this vegetarian stew because it’s so flexible on ingredients. Just pick and choose your favorite seasonal veggies, your choice of beans, few spices and simmer it all together. Don’t even bother to cut vegetables with precision. Huge chunks are absolutely fine. Just throw everything in your pot and let it simmer on low flame. Today’s healthy vegan stew recipe is so easy to put together. Stew makes a great one pot meal. Making stew in Instant Pot just requires 10 minutes of preparation time. It is completely hands off process once you put everything in the pot. No monitoring or stirring needed. You can make stew in a slow cooker but it takes way too long to cook. Dutch oven is a great hands-off choice to make any kind of stew too. The main reason behind making this stew is to use Swiss Chard. I had bought loads of it. You may use your choice of greens like spinach, kale or collard greens. To keep it simple and comforting I have used vegetables like sweet potato, potatoes, onion and loads of garlic. You may use carrots, radish, peas, pumpkin, bell peppers. Do not use cauliflower or broccoli if making this stew in Instant Pot as it will turn into a mush. I have used canned fire roasted tomatoes. Guys I am so obsessed with the fire roasted variety as it instantly adds so much depth to the stew as if it was simmering all day. But feel free to use crushed tomatoes instead. To make it more filling I have used previously cooked chickpeas. You may used canned ones too. Northern beans tastes great too. On spices front I have used salt, pepper, combination of smoked paprika and cayenne plus some garam masala (not curry powder). I like how heart warming the stew gets with garam masala. You may skip it if only it is unavailable or sub it with all spice. Ok let’s get to my favorite ingredient in making this stew. It’s peanut butter!! Guys I may sound crazy but this stew tastes so rich and good with peanut butter. Please try it. If you have nut allergy or do not like peanut butter you may leave it. Towards the end I have used a generous squeeze of fresh lemon and chopped cilantro. Because oh well!! I love to add fresh herbs to everything. How to make Vegetarian Stew in the Instant Pot? I have used pot in pot (PIP) method simply because I wanted to cook rice and the stew at the same time. You can just cook stew in the pot and eat it as is or pair it with grain / bread of your choice. What I have done is put all ingredients needed for the stew in m Instant Pot. Placed a long leg trivet on top. Then I kept a container with uncooked rice rinsed 3 times and filled with Fresh water and a pinch of salt. I have cooked it on rice setting i.e Low Pressure for 12 minutes NPR. Stew and fluffy rice is ready with only 10 minute preparation time. I could have done Manual High Pressure 3 minutes NPR but as it is a stew that we are making I love cooking it on a low setting for the flavor to meld. I have used my 6qt Instant Pot Duo (IP) to make this recipe. 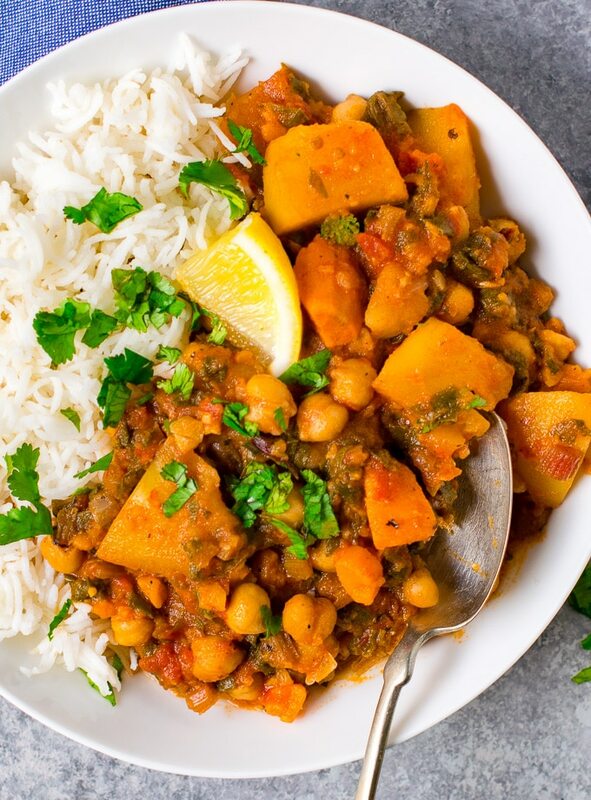 Make this nourishing bowl of vegan stew packed with protein and vitamins in your Instant Pot with 10 minutes of preparation time . Pair it with roti or rice . Makes healthy vegan lunch for office . Gluten Free. Rice pip method included. Follow this step only if you are cooking rice along with the stew. Take a cooker proof bowl that is 3 times the size of uncooked rice. Measure and put dry rice in it. Wash rice under cold tap water while gently rubbing it with your finger tips. Drain water and repeat the process 3 times. Drain all water completely and add fresh water and salt to it . Keep aside. Start IP on sauté mode. Sautee onions with couple spoons veg stock until translucent. Add minced garlic and sauté for a minute. Now add Swiss chard in batches. Press it down with back of a spoon and keep adding until everything is in the pot. Let chard wilt for 1 minute. Add in peanut butter . Stir it couple of times to avoid anything sticking on the bottom of the pot. Add ½ cup vegetable stock and deglaze the pot. Add in all the spices called for and give it a stir. Top it with chickpea, tomato puree, crushed tomato, sweet potato and potato . Add enough salt. You can always add and adjust later. Press CANCEL to get out of the sauté mode. Now place a long leg trivet on top of the stew. Place rice on the top. You may cover rice with a small lid but not required. Now close the Instant Pot, black knob on SEALING position and press rice mode . Let the pressure release naturally. NPR. Once the silver pin drops down carefully open the lid. Using a pot holder or dish cloth place the rice bowl on a heat safe base. Stir the stew and give it a taste check. Adjust spices or salt at this point. Add in chopped fresh cilantro. The stew will thicken considerably once it starts to cool. Just before serving add few drops of freshly squeezed lemon. Must try other healthy instant-pot-pressure-cooker-recipes here. This recipe is mild. The spice level of this stew is 2 on 5 . 5 being hot. Add more cayenne ( red chili powder) or finely chopped green chili/ jalapenos for more heat. The main reason behind making this stew is to use Swiss Chard. You may use your choice of greens like spinach, kale or collard greens. To make it more filling I have used previously cooked chickpeas. You may used canned ones too. Cannellini beans or kidney beans tastes great too. If you have nut allergy or do not like peanut butter you may leave it. Just smash few chickpeas with spoon to make the stew thick. Reduce stock by quarter cup if skipping peanut butter. Leftover makes great office lunch. The Nutrition calculation is given only for the stew and not the rice. Make sure you have us in your contact list so that the recipe does not land in spam folder. Carveyourcraving(at)outlook(dot)com .Happy cooking! Do share it with the world! This is a beautiful stew! It tastes fabulous and if very filling! Love it!